Acupuncture for weight loss is one of the newest dieting methods to cross into the mainstream. Based on traditional Chinese medicine (TCM), acupuncture is being used to treat a variety of health problems, with weight loss being a newer use for the ancient medicine. Acupuncture is the use of sterilized, long, thin stainless steel needles that can be inserted into over 2,000 pressure points in the body. Although acupuncture is practiced in Japan, Korea, and other countries, the Chinese method and theory is most often looked upon as the authority. TCM states that the body is made up of two opposing forces: the yin and the yang. Yin represents the cold and passive parts of the body/spirit, while yang is the hot and active areas. When these two parts are out of balance, qi (or life energy) stops following through paths called meridians. 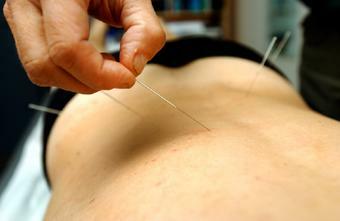 Acupuncture is the art of placing the needles at different points along the meridian path. For some people, acupuncture can produce a calming effect; for others, it can energize. Effects depend on the person, as well as what pressure points were used during the procedure. These effects may be due to the regulation of the nervous system. The theory is that these five needles will help fuel the production of endorphins, which are hormones that cause a person to feel good. Most acupuncture for weight loss is designed to reduce cravings for carbohydrates and decrease the appetite. A study reported in Acupuncture Today showed that women with a BMI (body mass index) of over 27 who used diet, exercise, and acupuncture lost more weight than those who did diet and exercise alone. While many claim that acupuncture for weight loss works, there are just as many detractors who feel that more compelling clinical trials and studies need to be done before releasing opinions either way. The British Medical Acupuncture Society does not confirm findings regarding the results of acupuncture used in weight loss. While the group does feel that short courses of treatment can result in suppression of appetite, achieving weight loss and maintaining it requires lifestyle changes. The American Academy of Medical Acupuncture lists the World Heath Organization's list of conditions that can be treated or supplemented by acupuncture, and weight loss and obesity are not included in this extensive list. Many physicians and experts fall in between the categories. While there are no conclusive results pointing to a direct correlation between weight loss and acupuncture, some feel that it does supplement other fitness efforts. Because acupuncture can help people feel less stress, it may lead to fewer episodes of binge eating. Acupuncture is also used in the treatment of pain, so for those with exercise-induced pain, it can help heal sore muscles faster, thus keeping people exercising. As with any healthcare procedure, thoroughly discuss the cost and risks with a physician. Because few risks are associated with acupuncture for weight loss (a slight stinging sensation at insertion site is the most common), it may be worth looking into as an enhancement to a current healthy exercise and diet program.